The Land’s End Hotel Donation. Photo courtesy of http://cornishman.co.uk. In the event of SCA, time is critical. An American Heart Association study showed that for every minute defibrillation is delayed, the victim’s chance of survival decreases by seven to ten percent. After 10 minutes, typical SCA survival rates could potentially drop to zero without any intervention, which is why it is always crucial to begin CPR and to connect an AED to a victim immediately following an SCA attack. As a result of the incident, the Australian opted to participate in HeartSine’s Forward Hearts program, which lets survivors of a Sudden Cardiac Arrest event, in which a HeartSine defibrillator has been used, to potentially save another life by donating a HeartSine samaritan PAD to the charity or organization of the survivor’s choice. 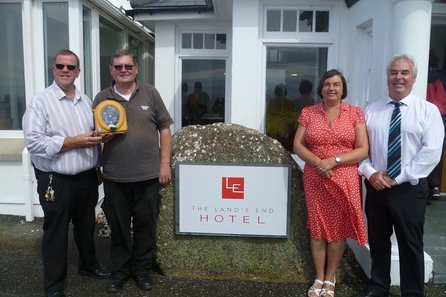 The donated AED was given to the Sennen School in Cornwall, where it will protect hundreds of students and faculty members in the event of a Sudden Cardiac Arrest, as the condition can strike regardless of age, race or gender, affecting all ages from infants to seniors.